What will you do, now that it has gone, now that it is over? 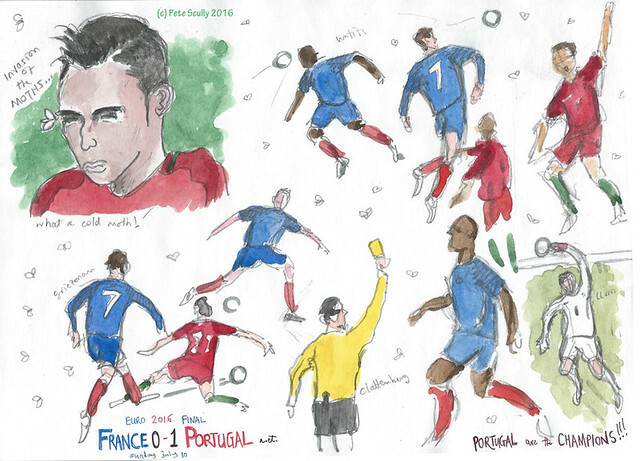 Euro 2016 is finished, Portugal walked away as champions, and that is that, no more football for a little while. Well, the football wasn’t always of the highest quality – it is international football, it rarely is – but there were a few good games, and a few historic results. 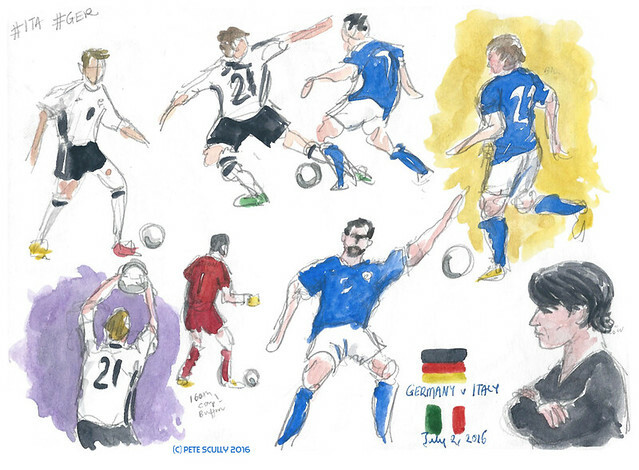 Here are the last few sketches I did during some of the games, starting above with Germany beating Italy. Sorry, technically Germany did not beat Italy (they never actually have, in a competitive tournament), they drew, and it went to penalties, hilariously bad penalties, penalties you would not believe. Simone Zaza. I did enjoy the creativity of Twitter after his very odd pre-penalty river-dance routine. Speaking of penalties, Portugal played out another draw, this time with Poland, beating them on swift and well-taken penalties. What else happened? Lewandowski scored in the 2nd minute making everyone think “this will be a great game!” but it wasn’t, and I can’t remember much else. Ronaldo probably took his shirt off. Wales were the last British team to exit Europe (if only there were some useful contraction to describe that phenomenon). Seriously, Wales got to the semi-finals of the Euros. I was starting to imagine that they might in fact go on and Do A Leicester. It was that sort of year. In the end, they Did A Tottenham, sis us all proud but ultimately fell down just before the end. 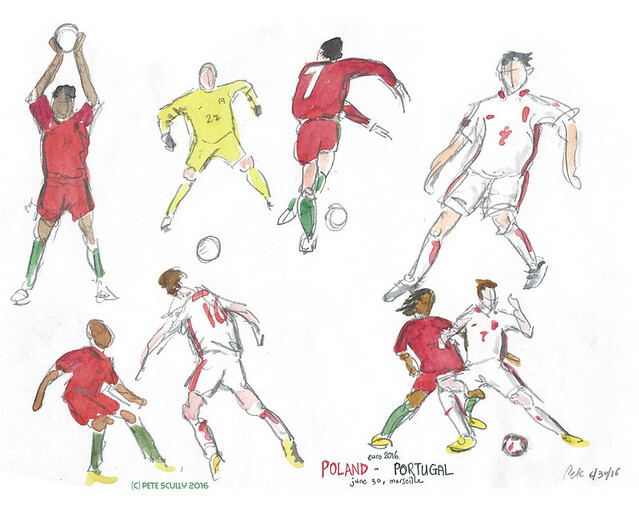 They wore that black and grey kit (I must say, I don’t like it much) to play Portugal (who also for some reason wore the away kit, that odd teal number (I don’t like that either). 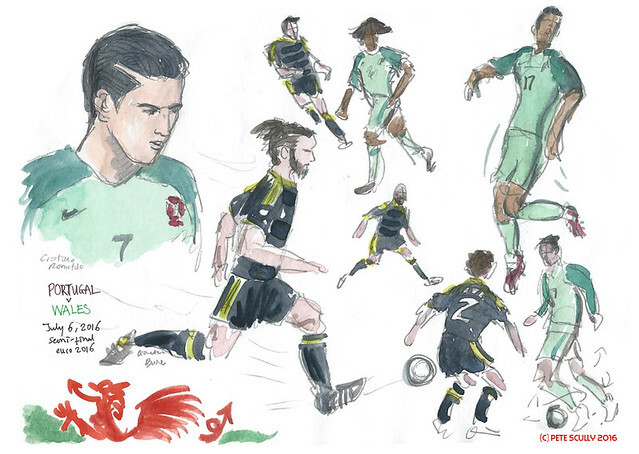 It was a decent match though, but Portugal had enough to get past the Welsh, who frankly suffered from losing two of their best players (Ben Davies and Aaron Ramsay) due to simple yellow cards (UEFA, your stupid rules ruin these tournaments). If they had played, I’m pretty confident it would have gone to 120 minutes or penalties, like all of Portugal’s games. Loved your moth story! Reminded me of the time I had just finished a botanical painting in watercolor. It had taken hours and hours and when I looked at the final piece I felt it needed just a touch more of blue in one particular petal. Just as I completed adding the blue a moth came along and landed on that exact spot. And you know what moths do; they flop all over the place if their wings get wet. That’s what she did ON MY PAINTING, and ruined all the hours of work. However, since it was a painting of nature, and she was part of nature, I picked it up and put it outside hoping the she made it. Wonder if she ever attracted any mates with the color that was so different from all the other moths. Love your writing style. Never knew I could be that interested in “fussball”.